Paid search management vendor Covario said today that PPC spending was up 52% in Q1 2008 versus 2007. 52% is a big leap for an already red-hot digital marketing tactic. But perhaps more interesting was the finding that Google took in 85% of the paid search spend in the first quarter. (No wonder Yahoo! rushed into their arms after Microsoft blew them off). This points to a big inefficiency in PPC in general. If Google has 71% of the search market based on total number of searches, but 85% of the PPC budget, then substantially more people are spending substantially more dollars in Google than necessary. 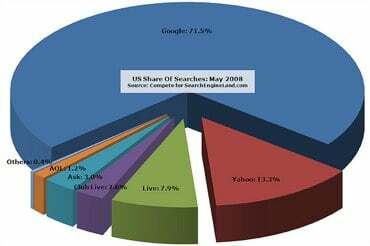 It’s not a mystery why paid search is up 52% and Google has 14% more spend share than eyeball share. In a down economy, marketers want to minimize waste, and Google PPC is the closest thing to a sure bet that’s easily available. (see previous post on digital marketing’s prominence in a recession). Marketers figure that if they have to retrench and focus on results and ROI, Google’s the place to go. But, if everyone is thinking that (and it appears they are), then the price for a click on Google PPC will continue to rise quickly to the point that profitability and ROI are impacted. I suggest monitoring your average cost per click carefully to see if this trend is impacting you or your clients. On a related note, this 85% Google share very much undervalues the importance of Yahoo! to many successful PPC programs. In many cases while working on client projects with Mighty Interactive, we saw Yahoo actually outperform Google. This is especially true for certain brands, as Yahoo’s users skew more female and less technical than do Google’s (and MSN’s users are even more female than Yahoo). So, if the Google gold rush is pricing you out of the market, swim upstream and put some dollars in Yahoo and MSN where the clicks are cheap and your competition has fled.